Before attempting to learn 6 Ball Juggling, you should at least have mastered juggling with 4 and/or 5 balls. You may also find that you require smaller juggling balls than you are used to so that they fit more neatly in your hand. If you have learned 4 ball juggling, you will know that this began with learning to juggle 2 balls in each hand in a pattern called the fountain. 6 ball juggling is learning many of the same steps except now you are expected to juggle 3 balls in each hand. A lot of 5 ball jugglers tend to skip learning 6 balls and move straight on to 7 ball juggling. There is certainly no reason why you can’t try learning both at around the same time rather than just trying to conquer 6 ball juggling, as it is going to take years (if not decades!) Also be aware that you will always meet someone who wants you to juggle “one more” (no matter how many objects you can juggle), so be sure and learn these numbers for your own sense of achievement and not just for others (most people will be mightily impressed though)! STEP 1: 3 balls in one hand flash. Try throwing 3 balls in one hand in an inward scoop (eg left hand would rotate anti-clockwise or right hand would rotate clockwise) and then just catching them. This will help you to get used to the speed, the height and also being able to finish cleanly. Practice in the opposite direction (outward scoop) and then practice with your weaker hand. Once this seems a lot easier, you are ready to move on, but please note that this step can take months/years to become smooth and effortless! STEP2: 3 balls in one hand – keep going! Now try to get as many catches as possible. It may help to take notes and you may find my Goal Setting and Note Taking article useful to read at this point! Try just doing 8 throws and catches, then 10, then 12 etc. Move up slowly and improve one small step at a time. Go for it and see how many throws and catches you can make. It is up to yourself whether you try and catch cleanly or just keep running the pattern and only stop when you drop. Both methods have their advantages and perhaps the correct answer is to try both and not just stick rigidly to one method all the time. Perhaps on some days one method is best for you, so do it! Collisions A lot of people find that their weaker hand wanders across towards the middle of the body, making it more likely to collide with the balls from your other hand. If you notice this happening, then make more of a conscious effort to keep your patterns in each hand a safe distance apart. Different heights of ball Try to get a consistent height with all of the balls in either hand. As soon as one throw goes that bit lower or higher, you begin to lose your tempo making it harder to continue. It is vital to get your weaker hand doing really well with 3 ball in one hand otherwise it is always most likely to make your 6 ball pattern fail. Finishing cleanly If you want to impress an audience, then doing an endurance with 6 balls until one of them lands on the floor isn’t going to go down well. Practice being able to do a short run of 6 balls and finish cleanly. Also when you realise that your pattern is going to result in a drop, practice being able to finish cleanly rather than make a drop. 3 Ball Snake: The tempo should be similar to when you are throwing 3 balls in one hand. Start with all 3 balls in one hand. Throw them one at a time to the other hand in an arc. As soon as this hand begins receiving the balls, it throws them back in an arc. This looks like a snake as all the balls are following each other in a tall and wide cascade style pattern. High 4 Ball Pattern: Throw a 4 ball fountain as high as you would do for a 6 ball pattern. This lets you get used to the correct height. Try it synchronised and staggered. 4 Ball Flash pattern: Throw the 4 balls even higher and try clapping your hands once or maybe even twice before catching and continuing the pattern. Increase and Decrease Hold time: Now try throwing (in a sync pattern) the balls so that you have as much hold time of the next 2 balls as possible. Now try the pattern using the least amount of holding time possible (eg as soon as they are caught, the balls are thrown again). 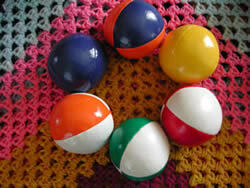 This will get you used to the speed of 6 ball juggling. Half Shower: This is perhaps the first crossing pattern with 6 balls that you should try. Starting at the same time, throw a ball from each hand, but let the throws from your dominant hand be slightly higher so that the balls do not collide. The idea is to always throw 2 balls at the same time, and make sure they don’t collide. 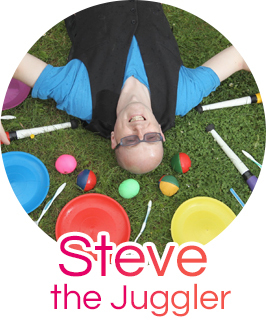 The best tip I can find for improving your 6 ball Juggling is to get along to your nearest Juggling Club and meet with other numbers jugglers on a regular basis. You can encourage and spot the mistakes in each others patterns in a fun and friendly environment. As I am still learning 6 Ball Juggling, I thought it best to get some advice from someone who has used this page to help improve their skills and can now offer their own advice in addition. Thanks to Tristan Cox (Tristan Cox Website) for stepping forward and providing the following additional tips! The best tip is to to keep your elbows low and DO NOT move them. That is key. Find somewhere with a high ceiling to practice (indoors is better than outdoors as you don’t have to factor in the weather or strong sunlight). Throw diagonally, have at least four balls in the air at the same time, keep your hands next to each other, and don’t move your hands too fast or throw too low. Keep your hands parallel to the ground (do not turn them sideways to make throws).